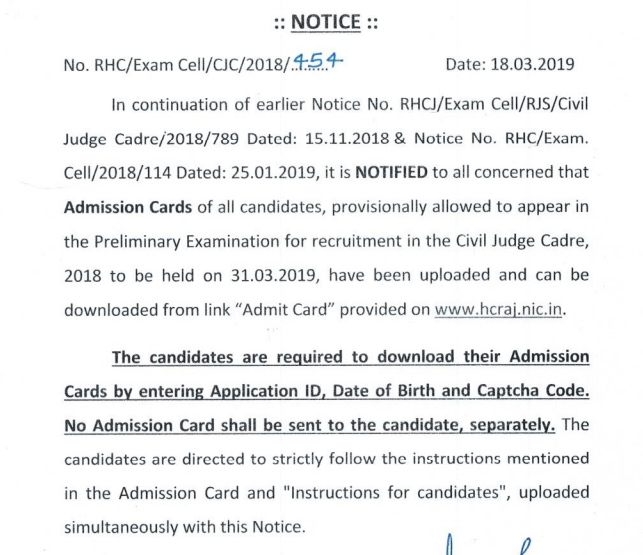 Latest Updated On 18.03.2019 :- Rajasthan High Court Has Released The Admit Card For Civil judge. Exam Will Be Conducted On 31.03.2019. Candidates Can Check The More Details From Below………. Rajasthan High Court has invited the Candidates for the Recruitment of 197 Posts of Civil Judge. There are many Candidates who filled there Online Application form for these Posts. The Process of Application Submission is Started From the Date 26.11.2018 & 05.01.2019. Here we are Sharing the Direct Link to Check the Detailed Recruitment so that the Candidates will check every information about the Recruitment. There are many Candidates who filled the Application form and will face the Exam. The Exam will be Conducted Soon and the date of examination will be announce later. More Details about the Examination is provided below. Question Paper Will be Based on the Subjects i.e. Law Paper – I & II, Hindi & English Proficiency. The Time Duration for the Examination will be 02 Hours. Note: To qualify for Main Written Examination, the candidates of SC/ST category shall have to secure minimum 40o% marks and candidates of all other categories shall have to secure 45% minimum marks in the Preliminary Examination. I forget my application no. how i will get it? HOW CAN I Contact to the official Department ? FOR THE PROBLEM ABOUT TOKEN NUMBER. IS ANY toll FREE no. AVAILABLE ? Hv u got ur token no.???? Sir mera Admit card Rjs ka download Nhi ho raha h.reference no &date of birth fill ker dya .id not valid bol raha h.
Sir i lost my application ID what can I do ? ?